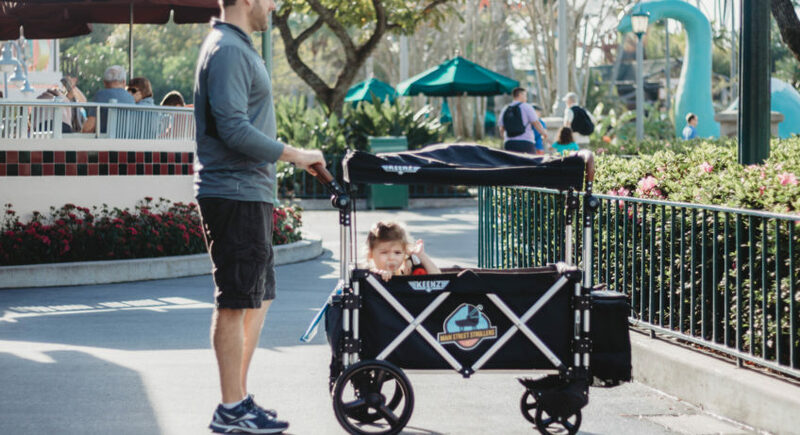 Update: As of May 1, 2019 Disney World will no longer allow stroller wagons in the park. When my in-laws first proposed the trip last year I wasn’t totally on board. My daughter would be 2-1/2 and we didn’t know where we would be with potty training, nap schedules, etc. 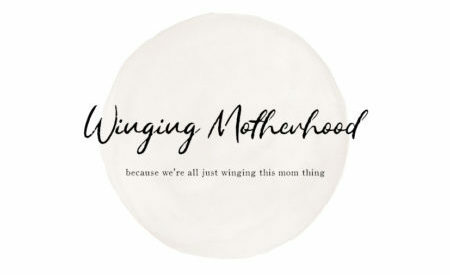 We were planning on trying for another baby soon, and if it went as well as the first two times we conceived it probably wouldn’t take long, so I estimated that I would be 5-6 months pregnant at the time of the trip. But my husband’s family was really excited about it so I agreed. Would I do it again, just us? Nope. We’re not ‘Disney people’ I realized. I’m totally okay with not going back for a long time. My daughter was too young to enjoy a lot of the rides (and I was too pregnant to go on most of them) and she was frightened by a lot of the shows. She isn’t a fan of characters in costume and patience is not something she has a lot of these days. But I am glad we went because it will probably be the only time we do a trip like that all together. You can’t do Disney without a stroller. My sister-in-law even rented one for her older kids, who are 5 and 7 and probably haven’t ridden in a stroller in years. But the days are long and little legs get tired. We opted for the Keenz Stroller Wagon because I wanted something that my daughter would be able to lay down and take a nap in. This allowed us to stay in the park rather than packing everything up, waiting for the bus to take us back to the resort, getting her to nap in the hotel, then packing everything up, heading back to the park and going through the check-in and security process for a second time. It would have turned our 2-hour break from activity while she slept into a 4 or 5 hour ordeal, and we would’ve missed out on half of the day. This company was an absolute dream to work with. The stroller tech dropped the stroller off to me at the hotel shortly after we arrived. I communicated with him via text message so I knew exactly when and where to meet him. He gave me a quick demonstration on how to use it because it wasn’t something I was familiar with. When we were done with it at the end of our trip, he picked it up before we left for the airport. No waiting in lines or having to trek to an off-site rental location. If you’re not staying on Disney property – no big deal! Main Street Strollers will deliver within a 15 mile radius from Walt Disney World. This includes Universal Studios, Sea World and all International Drive hotels and attractions. Main Street Strollers offers three options for stroller rentals: Britax B-Agile Single, Britax B-Agile Double and the Cadillac of strollers, the Keenz Stroller Wagon. While it may seem more convenient to just rent a stroller when you get to the park, I definitely would not recommend going that route. You can’t take those stroller out of the park. So even if you’re staying at a Disney resort, you can’t bring it back to the hotel with you. That means you’re carrying all of your stuff from the hotel to the bus, from the bus through security and to the stroller rental location in the park. And back again. Everyday. Planning to park hop? You’ll have to return your stroller before you leave and pick up a new one at the next park. And if your plans include any non-Disney activities while you’re in Orlando, you can’t bring it there either. I’m not sure the strollers available to rent at Disney should even be considered strollers. For all of the high-end, over-the-top options Disney has to offer for just about everything, strollers are not one of them. They’re hard plastic chairs on wheels with no sun protection, no storage and no cup holders or trays. They don’t recline, so forget about naps. I felt sorry for all of the kids I saw being pushed around in these things. Especially because a stroller rental from Main Street Strollers is LESS EXPENSIVE than what you’ll pay for a stroller at the park. The double stroller is $31 a day. The double stroller option from Main Street Strollers can be rented for an entire week for just $70. And it’s YOURS for the week. But what you really want is the Keenz Stroller Wagon. I can’t tell you how many people stopped to ask me about this incredible stroller while we were at Disney World. At least a dozen people asked to take a photo of it. After using it for a week, we are sold. This is hands down the best stroller there is and we’re planning to purchase one this summer. While we were there my daughter napped in it every afternoon. Because she could. Comfortably. And safely. Even the best traditional strollers can’t offer a full recline with total protection from the sun and wind. With plenty of space to lie down, my daughter easily napped every day we were there. The sides are tall enough that she was protected from any wind and the curtains roll down so that she was protected from the sun. You definitely don’t get this with a traditional stroller. And when she fell asleep at the end of the day, we didn’t have to risk waking her to return the stroller at the gate. We wheeled her right out of the park to the bus so that no one had to carry her (it’s not a short walk) and she could continue to sleep until just before we had to board the bus. Folding up the stroller took just seconds and can easily be done one-handed. While we were enjoying the parks each day, she spent most of her time enjoying the view from inside the wagon. The canopy offered shade and could be retracted when we wanted to keep an eye on her. When she didn’t want to ride, the included tagalong handle gave her something to hold so that she didn’t wander far from us. While we didn’t harness her, the wagon does have two 5-point safety harnesses if you wish to do so. The Keenz Stroller Wagon, despite its size, is incredibly easy to push. With 10 different handle positions, it didn’t matter who was pushing the stroller, it was always a comfortable height. The large rear wheels enable it to handle any terrain with ease and the parking brake is very easy to engage/disengage, even while wearing flip-flops. The front wheels each have a lock as well. I found it very easy to navigate the crowds at Disney, especially because it’s even more narrow than some of the double strollers we saw. And finding it among the thousands of other strollers in the designated stroller parking areas all over the park was easy thanks to the large sign Main Street Strollers provided us with. Since we didn’t get a meal plan ahead of time, we brought our food in to the park with us each day. The attached cooler held two meals for each of us, water bottles and plenty of snacks – enough to keep this pregnant mom and a toddler satisfied. Since it’s attached to the front of the stroller, we didn’t have to worry about removing it when we collapsed the stroller on the bus, leaving us with one less thing to carry. During the day we all had easy access to whatever we needed. 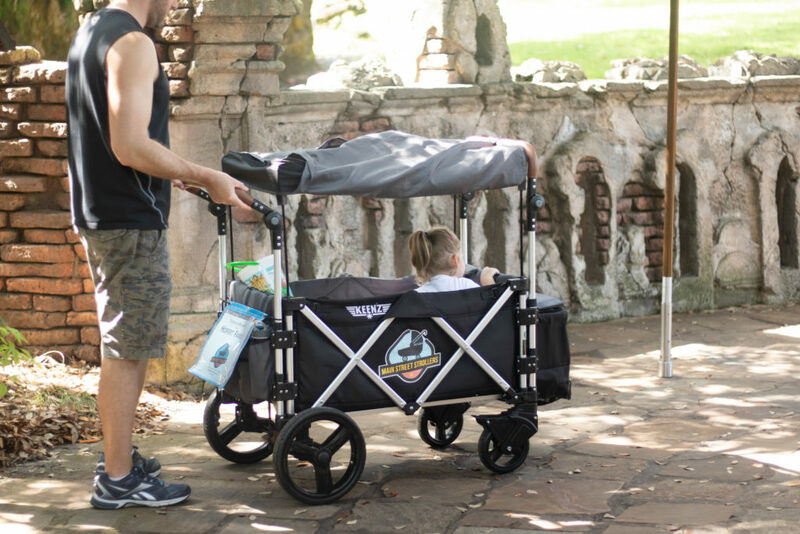 The other side of the stroller features a pocket for a water bottle as well as a couple of additional pockets for storing your phone, camera, a pair of shoes, or anything you might want to have with you at the park. When you rent from Main Street Strollers, you’ll also receive a rain cover, which (luckily) we didn’t need. Several people warned us about this – if a quick storm came through while you were standing in line your stroller could get drenched in a matter of minutes. Thankfully, we were always prepared and never had to worry. So while we don’t plan to take another trip to Disney anytime soon, when we do, a Keenz Stroller Wagon from Main Street Strollers is the first thing I am going to reserve. Even if we own one at the time, I wouldn’t risk traveling with it. Especially because Main Street Strollers makes it so easy. Main Street Strollers provided this stroller rental at no cost to me in exchange for a blog post and review. No compensation was received from Keenz. Disclosure: This post may contain affiliate links. As an Amazon Associate, I may earn a small commission on qualifying purchases. Oh man, we are trying to do Disney next summer. Our kids will be 6 and 3.5! That wagon looks awesome and super functional to maneuver in a crowded park. I would definitely recommend renting the Keenz wagon from Main Street Strollers for your kids while in Disney!! It was such a lifesaver for us. Wow! This wagon/stroller sounds so amazing! I want one for my little girls! We saw those when we were there! I thought they looked cool. 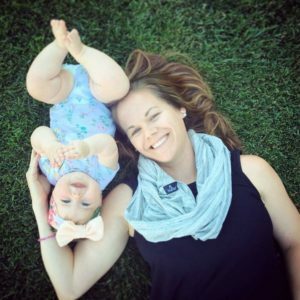 This post is super super helpful! My son will be 2 in a couple of months and while we aren’t going to Disney just yet, I know it’ll come around quick. So once we are ready to plan that trip, I will be able to have a look and do some comparison now. I think a wagon is the best idea! Thank you! Just be aware that as of 1st May 2019, wagon type strollers are banned at WDW.